Keisuke Honda might do a double take if he lines up for Victory on Tuesday night. 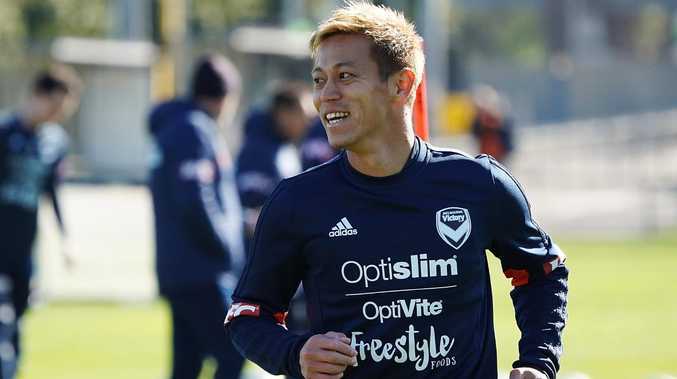 KEISUKE Honda may do a double take if he lines up for his Melbourne Victory debut against APIA Leichhardt in the FFA Cup on Tuesday night. For he won't be the only Japanese player on show - and for Tasuku Sekiya, the chance to play against his nations' football idol is a dream come true. 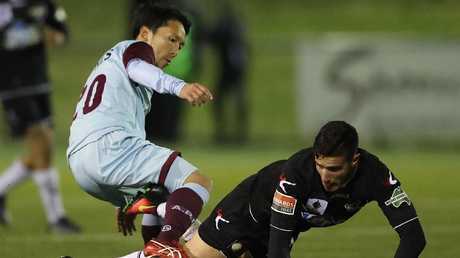 25-year-old Sekiya, whose winner against Port Melbourne in the Round of 32 set up the mouth-watering clash against the A-League champions, says he's been looking forward to the match, ever since the draw was made. "I can't wait. A couple of months ago he was playing in the World Cup, and I watched on television, cheering him on. When he scored the equaliser against Senegal I was screaming, I was so excited. I can't imagine to play against him. No-one would have expected me against Honda," Sekiya said. While Honda's career has taken him to AC Milan and to three World Cups (he scored in all of them), Sekiya's professional career stalled as a junior at Shonan Bellmare. He arrived in Australia on the recommendation of his agent, ex-NSL star, Naoki Imaya, and still has designs on carving out a professional career, preferably here in Australia. Tasuku Sekiya could line up against his nations’ football idol on Tuesday night. "I would like to play in the A-League. I would sign with any club of course, but I watched Sydney FC a lot last year, and Western Sydney Wanderers too. Wanderers have had Japanese players - Jumpei (Kusukami) and Shinji (Ono) of course, and others too. They inspire me - encourage me," Sekiya said. This season Sekiya has hit 10 goals in 20 NPL matches, and while Honda might not be across the career trajectory of his compatriot, there is a connection between the pair. "One of my friends is playing for the Japanese national team - Wataru Endo, who plays in Belgium - me and Wataru used to play together when I was at high school. Wataru and Keisuke played together in Russia, so maybe he has told him about me," Sekiya said. Honda is believed to be picking up a salary of close to $3 million for his spell with Victory and his personal fortune is estimated to be worth around $US80 million. Sekiya has scored 10 goals this season. By contrast, Sekiya supplements his football income by doing a little coaching, and working at an iconic Sydney tourist venue. "I work as a kitchen hand at the Opera House. I like it, it is a good opportunity for me, although I did study law at university in Japan. 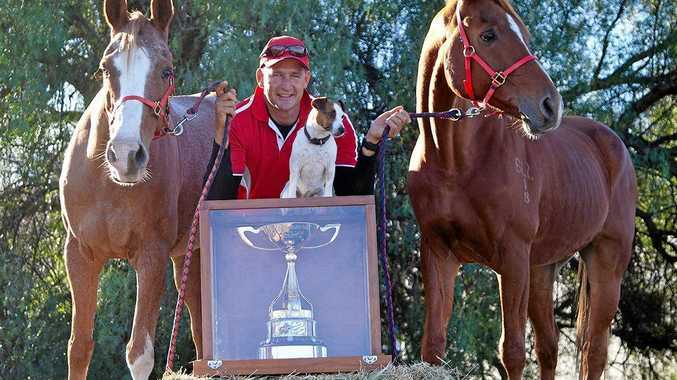 I have had to ask my boss for the day off on Tuesday though, I normally work Tuesday mornings," Sekiya said. Sekiya's APIA missed out on the NPL (New South Wales) Premiership on the final day of the regular season after suffering a shock 2-1 home loss to Hakoah East Sydney (Sekiya scored their solitary goal) last week. The result not only handed the crown to Sydney Olympic, but meant they had to play a finals game against Sydney United on Saturday, not the best preparation for a big Cup tie three days later. "Physically, it would be better to have a week off, we wanted that, now we have just two days to prepare. It's going to be difficult to play twice in that space of time. But mentally, if we had a week off, we might be thinking about it." Sekiya said. A further issue for APIA is that the Cup tie will be played on grass at Leichhardt Oval, not the artificial surface they are used to at their proper home of Lambert Park. They also have bad memories of Leichhardt Oval, having lost the NPL (New South Wales) grand final there on penalties to Manly United in 2017. But Sekiya says they will be ready come Tuesday night. "I watched a lot of their games last year. I was at the Sydney FC v Melbourne Victory game in the semi-final. When we went to Melbourne in February for our pre-season, and played Avondale, we also went to AAMI Park to watch them, also against Sydney FC. They are a very good team, and they are training every day, they can focus on football 100%, so it's a big difference to us," Sekiya said. But whatever the result, if Sekiya gets to face one of his heroes, he will have a great story to tell back home in Japan. "He has great skill of course, but he also has great mental strength, confidence. He is different from other players," Sekiya said.
" I loved Shunsuke Nakamura. I watched him a lot when I was a teenager and he was at Celtic. But Honda is the best Japanese player of his generation. I have spoken to friends and family in Japan, mI have had a lot of messages from them. They tell me, you have to take a photo,you have to get his shirt."